I made cookies of the first time in almost a month today and the males in my house ate them within a couple of hours. It always amazes me how they claim that they don't really like sweets and then eat a ton of them. I have been attempting to limit the amount of sweets that my family eats and I have been successful except for the whining. The last couple of weeks I have heard a lot of whining including my oldest telling me that I didn't love him as much anymore since I hadn't made him cookies as an after school snack. Instead of cookies and baked goods I have been trying to make sweeter snacks that are healthy as well as delicious. I absolutely love avocados and recently have read a number of sweet recipes that incorporate them. Today I tried a new recipe for Chocolate Avocado Shakes from the April 2013 issue of Eating Well magazine. This recipe has 7 ingredients. It takes 10 minutes of total time, all of which is active and makes 2 servings. For the milk I used vanilla almond milk, maple syrup for the sweetener and dark chocolate chips for the chocolate. If you wanted to make the recipe vegan you could use nondairy chips. I used the ice setting on my blender to blend everything up since I wanted to make sure that there were no large ice chips. These shakes were a little too adult tasting for my kids. My husband and I really enjoyed them, but my two boys thought that they tasted weird. That was fine by me since it meant that there were more for me. I like that this recipe is high in potassium since my potassium got dangerously low last winter so I make sure to eat a large variety of high potassium foods. It is also full of healthy fats; avocados are a great way to add healthy fats into your diet and this recipe is nice since it is also sweet. 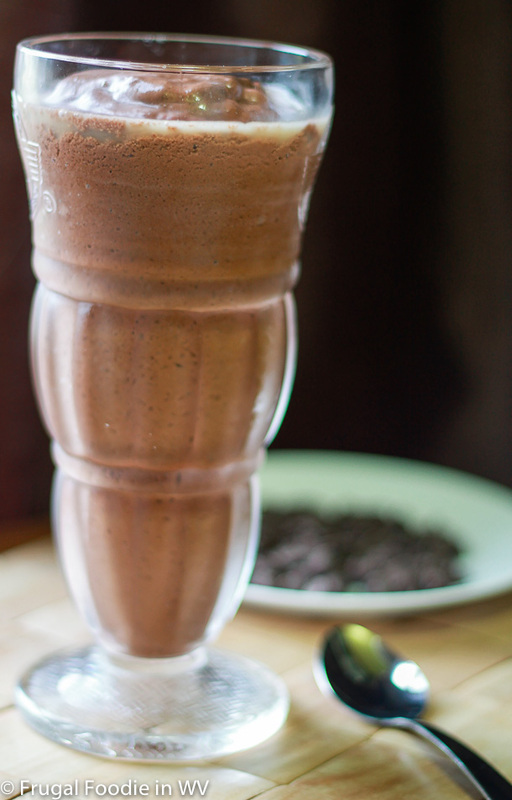 For the recipe go to Chocolate Avocado Shake. Thanks :) It really was good! It depends on how many ice cubes you put it. If you put the twelve suggested it is more like a milk shake, if you were to use less it would be thicker more like a pudding. Does it taste good? I only tried it with milk (or course lol) but not with chocolate. Not sure if they're a good combination. I'm not a big avocado fan, but I do like the health benefits of it, so I would actually try something like this - especially if the chocolate taste was there to cover up the avocado. It really is great for you and you can't notice it since the taste of the chocolate is so much stronger. I am obsessed with Avocado so I can't wait to try it! I came to you from the Thursday Favorite Things Blog Hop! I am excited to spend more time on your site! I am hosting a party tomorrow at http://www.frugalfitfamily.com! Come by and Link up if you get a chance! Very interesting, I have never heard of chocolate and avocado. I will try it! I am visiting from Katherine's Corner. If you try it tell me how it turns out :) Going over to check out your page! These sounds super interesting. I've never thought to put avacado and chocolate together. Thanks for sharing, I love my daily green smoothies and might try this one. Blog Hopping from Katherine's Corner - have a good week! Oooh yummy! I made a chocolate avocado mousse a while back and found that I had to let it sit in the fridge for about an hour before the avocado taste went away. I tried it before putting it in the fridge and it tasted too strong! I didn't notice the taste of the avocado in this. There is a tablespoon of vanilla, so the vanilla taste is noticeable, but not the avocado. I never saw those two flavors mixed together. Sounds so different. You said it was delicious so I have to go by that! Wha???? This sounds so interesting! The flavors work really well together, my husband and I really liked it! This sounds really interesting! I would love to try them. We are always interested in new recipes with avocado. I have had chocolate and avocado together, very creamy in my mouth. If you end up trying it tell me how it goes :) Going over to check out your blog now! Thanks :) Going over to your page now! These sound awesome to me! Pinning! Thanks for linking up at Made in a Day last week! OMG what a great idea!! Perfect for tricking kids into eating avocado!!! Thanks for visiting me today at chicken nuggets and cookie butts!!! It really is a great way to add nutrition into a kids diet! Yum sounds good, I made one with out avocado but used almond milk, melted chocolate and it was delicious! I am sure it will be so nice with avocado too, cant wait to try it! I'm so glad that you liked it :) Thanks for telling me how it turned out!